The largest fleet since 2000 joined the Baja Ha Ha for the annual trek to Cabo San Lucas via Turtle Bay and Bahia Santa Maria. 150 boats made it the entire way with a wide variety of conditions and situations. The rally started on Halloween in San Diego with a huge send off of Media, fire boats, horns, and by standers on shore and on the water. The winds were light at the start so the “Rolling Start” was initiated where boats motor at 6 knots until the wind fills in. Then the “Grand Poo Bah” Rich Spindler announces that the sailing starts. At 1:00 on October 31’s the wind filled in and the fleet took off on a nice 10-15 knot wind that continued into the evening. As the night rolled on the wind increased to 20 knots and held through the next day when it built the next night into the high 20’s with gust into the 30’s. The waves built and for most of the boats it was a good test to see how you stored your gear. The higher winds meant several boats had sail repair issues. Ullman Sails was on hand to do emergency repairs on several sails at each stop allowing people to continue having fun to Cabo. 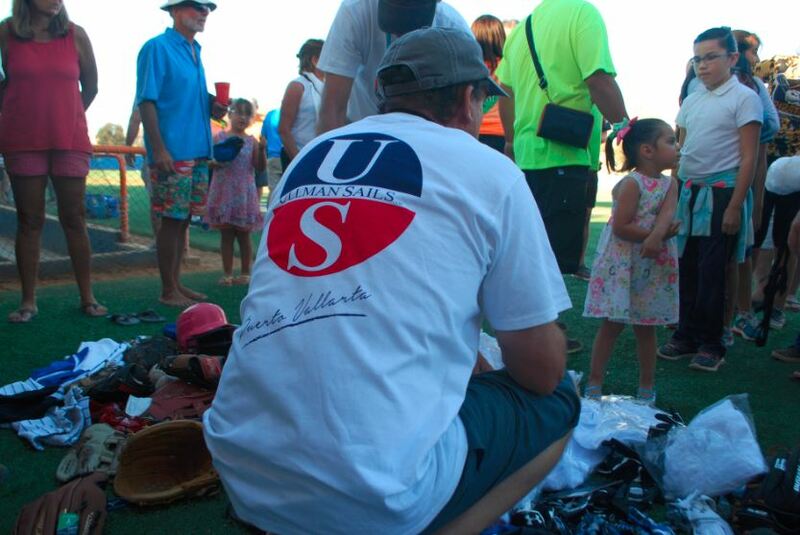 Turtle bay was buzzing with people and the annual Baja Ha Baseball game. Everyone hits and everyone has a great time. After the baseball game the Ullman Sails had organized donations of mostly new and some used baseball gear to give to the youths of Turtle Bay. From Ullman Sails Puerto Vallarta $2,000.00 of new gear and nearly the same in used gear was donated by other sailors as well. The annual Turtle Bay Beach Party hosted by the team at Latitude 38 had Volleyball, Tug –a- war, and other activities for most of the afternoon. The sail to Bahia Santa Maria was much more subdued compared to the first leg and the water was warmer. Still sail repairs had to be made but much more relaxing for the crew on Ullman Sails. Many sailor took advantage of great weather and went for hikes and tours of the mangroves. The Rock and Roll beach party at Bahia Santa Maria is a favorite of almost everyone. Dancing for hours with great sea food in a very remote location is hard to beat. The party ends at night fall so cruisers can find their boat and get rest for the early start to Cabo the next morning. The Wind on the next leg was little to none much of the time with a few boat arriving just before the El Squid Roe party where the Ha Ha fleet takes over the entire bar until closing time.